It was the selfie that should have said 'peace' between erstwhile enemies at a beauty contest in Las Vegas. Instead, it led to death threats and the banishment of a family. 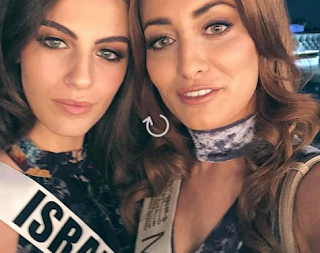 Little did Adar Gantlesman, Miss Israel, and Sarah Idan, Miss Iraq, predict that Sarah's family would have to flee after a selfie showing the two of them posing together went viral. Sarah Idan said that she had Israeli and Jewish friends. Some of those, she said, had been born in Iraq and themselves had had to flee. Miss Iraq, the first to represent her country in a beauty contest for 45 years, refused to take the selfie down. According to this report on Israeli TV, the two beauty queens have remained friends via Skype. 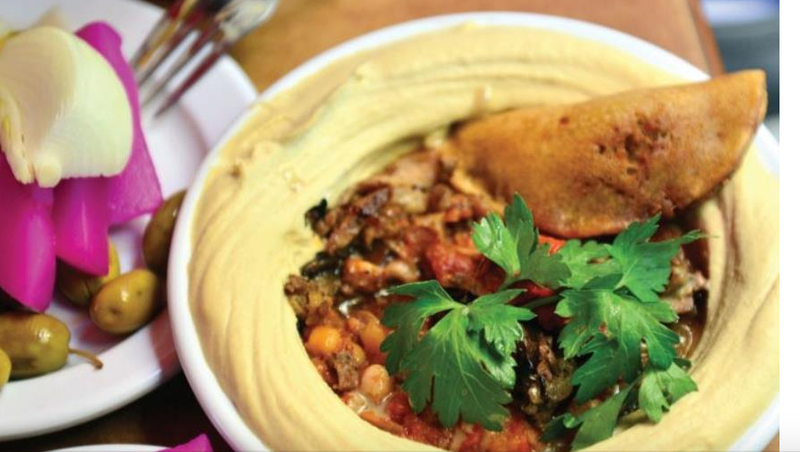 In a Twitter battle that raised eyebrows on both sides of the Atlantic, James Zogby accused Israel of “cultural genocide” after American celebrity cook Rachael Ray posted a photo of “Israeli nite,” with hummus, stuffed grape leaves and other edibles. Zogby, the founder of Arab American Institute, and managing director of Zogby Research Services, took issue with Ray’s December 21 post: “Holiday feast highlights – Israeli night, meze, stuffed grape leaves, hummus, beet dip, eggplant and sun dried tomato dip, walnut and red pepper dip, and tabouli,” she tweeted. Bret Stephens, op-ed columnist at The New York Times and a former Jerusalem Post editor-in-chief, joined the battle on Tuesday. “Please tell me this is a joke tweet,” he wrote. “Or is it ‘cultural genocide’ when Arabs use Israeli technology? Do you use Instant Messaging? Waze? If so, please stop.” Waze was invented in Israel. Zogby responded that the case would only be similar if he used Waze and then claimed it was Lebanese. Zogby’s father was a Lebanese immigrant to the US. 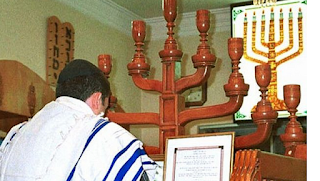 The city’s Kashi Synagogue was attacked Sunday night, while the Hadash synagogue was attacked Monday afternoon, according to Sam Kermanian, senior adviser to the Iranian-American Jewish Federation, who has been in touch with Jews from Shiraz. The local Jewish community believes the attacks were committed by more than one person, but does not know who perpetrated them. An earlier report by a member of the Shiraz Jewish community on the vandalism at the Hadash synagogue was broadcast by Israel’s Channel 10 on Wednesday. The community member said the damage was documented by a pair of journalists and three local Jews. Blurry footage aired by the television channel purported to show the damage in the synagogue. An Iraqi author has for the first time written about the role of the Istiqual independence party in setting off bombs to scare the Baghdad Jewish community in 1950. The assertion may now put an end to decades of speculation regarding who was behind the bombings. 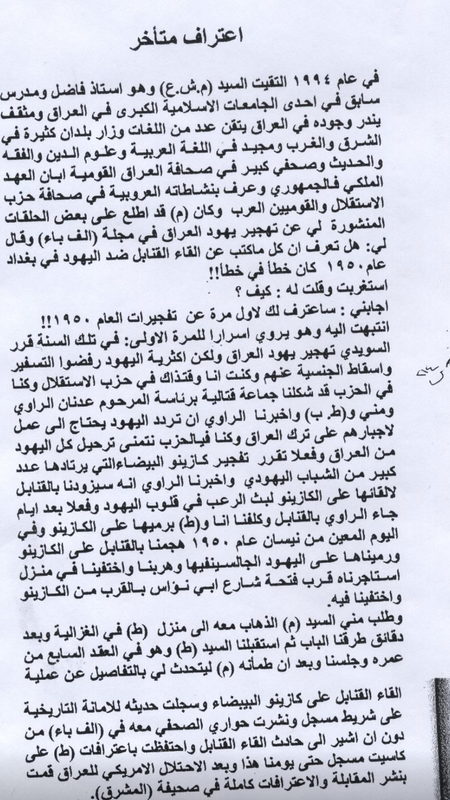 In a book in Arabic about the history of Zionism in Iraq, Abdul Kader mentions that the nationalist Istiqlal party was responsible for the bombs. Hitherto controversy has surrounded the incidents. Some Iraqi Jews themselves have pointed the finger of blame at the Zionist underground. Mordechai Ben Porat, the leading Mossad operative, has always protested his innocence and in the 1960s even sued an Israeli magazine for libel. He won his case, but a cloud of uncertainly has always hovered over him. 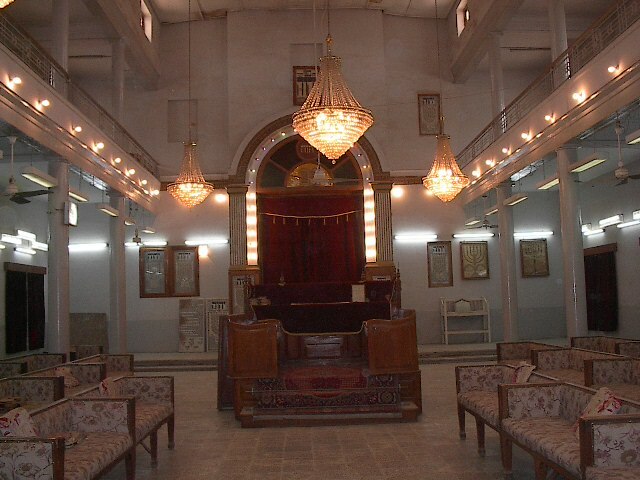 The only fatal bombing took place at the Messouda Shemtob synagogue in January 1951. It was being used as a registration centre for Jews seeking to emigrate to Israel. The page in the book by Abdul Qader blaming the Istiqal party for the bombings. 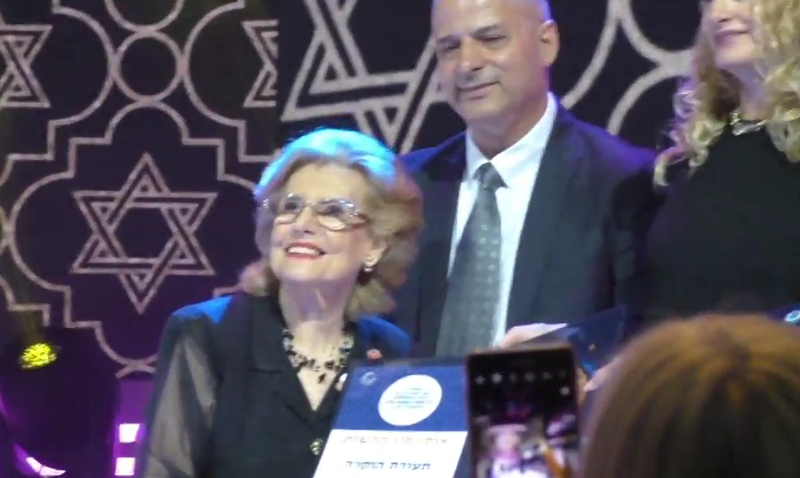 Levana Zamir, the president of the umbrella organisation of Associations of Jews from Arab countries in Israel, was one of 12 Mizrahi figures given the Ministry of Education Award for their contribution to Israeli society and to the State of Israel. Mrs Zamir received her award along with 11 other Mizrahim, including Shlomo Hillel and Erez Biton. The award was inaugurated by the ministry to honour Mizrahim who have made an outstanding contribution to the state of Israel, and promote their achievements to a wider public. The award ceremony on 19 December at Binyanei Ha'Uma in Jerusalem was attended by 3,000 guests and officials. Guests were given a hand-out listing the biographies of sixty prominent Mizrahim. This will apparently be distributed to schools. Being well-versed in Egyptian as well as in Israeli culture, Mrs Zamir, then president of the Israel-Egypt Friendship Association, was invited to accompany the Israel president Ezer Weizman and his wife Reuma on their official visit to President Mubarak in Cairo. " We created the easy atmosphere needed for a successful visit. We need to get know the Other, for to know him, is to love him," she said in a pre-recorded interview. Mrs Zamir, whose working career began at 16, also recalled her role as PR director of the French Aeronautics Industries in Israel, OFEMA. "Following the Six Day War, we were furious that General de Gaulle had declared an embargo against Israel, stopping the delivery of the 50 Mirages-5 that Israel had bought from France. It had already paid for them, and our Israeli Airforce pilots had just completed their training in France." Together with Marcel-Dassault Aviation and the Israel military attache in France Moka Limon, OFEMA in Israel embarked on a clandestine mission to smuggle the 50 Mirage-5 fighter planes to Haifa from the French port of Rochefort. Thereafter, Israel began developing its own fighter aircraft, the Nesher, modelled on the Mirage 5. "Embargo or not, in Israel we never give up. It was a huge responsibility but we did it,' Mrs Zamir said. During the late 1970s, Mrs Zamir headed ALSAM, the Anti-Drug Abuse Association in Israel. She established a hostel for the rehabilitation of addicts, as well as programmes in schools to teach children to say no to peer group pressure. In the 1990s, Mrs Zamir chaired the Women Entrepreneurs' organisation in Israel to help women break the glass career ceiling. "Thirty years ago, women were asked,'what does your husband do? Today, they are asked: what do YOU do?" she commented." There is much still to do, but I am very proud of the achievements of this generation of young women." Her elation at receiving the award was tempered, however, by regret that there were four women only among the 12 successful winners, just reaching the 30 percent threshold required by law for any Israeli public forum. Assyrian and Chaldean Christians have returned to their heartlands to celebrate Christmas in parts of northern Iraq for the first time since the routing of Islamic State, Reuters reports. 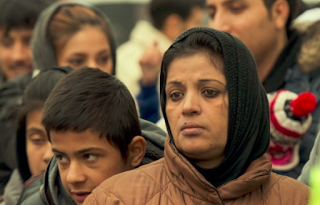 Like every other resident of Teleskof, this was Daoud’s first Christmas back home in three years, since Islamic State militants overran her town and forcibly displaced its 12,000-strong Chaldean Christian community. “It’s so special to be back in my church, the church where I got married, the church I raised my children in,” the school headmistress said, tears in her eyes. Faced with a choice to convert, pay a tax or die, Daoud, like many other Christians in the Nineveh Plains, chose to flee. Most sought refuge in nearby towns and cities, but many sought permanent asylum abroad. Though the militants were only in Teleskof for a few days, residents only began returning home earlier this year. On Sunday, they celebrated their first Christmas together again at the town’s main church, which was overflowing. Hundreds of congregants, dressed in their finest, poured in to pray and receive communion from Father Salar Bodagh, who later lit the traditional bonfire in the church’s courtyard, a symbol of renewal he said. 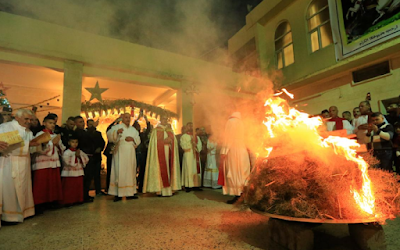 Despite the obvious joys of being able to celebrate openly once again, it was a bittersweet Christmas for most across the Nineveh Plains, the epicentre of Iraq’s ancient Christian communities which can trace their history in the country back two millennia. My grandfather was a very proud person. He uttered not a word about the Holocaust he endured in Libya; only once did I hear him talk about the renta, the reparations from Germany, which, by a cruel irony, began arriving a month after his mother died. I heard that his mother’s back had been broken in the camp and that from then on she was completely hunched over. So I also understood that there had been Nazis there. At first, my family’s involvement in that incomprehensible event seemed to me improbable, and later negligible. At some point I started to explore the subject more deeply, and heard about the Giado camp, closed in by a barbed-wire fence, with wooden huts holding more than 300 people each. 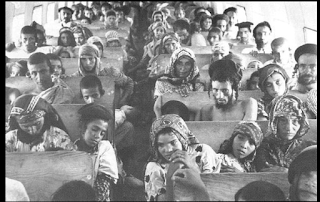 About 2,600 Libyan Jews were transported to the camp and subjected to forced labor. They suffered from hunger and disease, and were the victims of daily abuse. Many were murdered – 562 Jews died there – and dozens more were sent to death camps, notably Bergen-Belsen. To this day, it remains unclear whether Giado was a ghetto, a forced-labor camp or a concentration camp. What can be said for certain is that there were many camps like Giado across North Africa. The echoes of war also reverberated in other Arab countries, such as Iraq, where pogroms and other violent incidents took place. 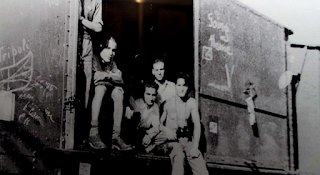 All this is part of the unknown story of the Jews of the Middle East during World War II – a story that is not part of the construct of the Holocaust experience in Israel. In a new book, Yvonne Kozlovsky Golan, who specializes in film history and teaches at the University of Haifa, seeks to understand why the Holocaust experience of these Jews is absent from Israeli media and art, and what this obliviousness signifies. 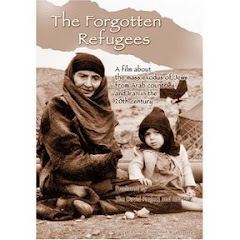 The idea for the book, “Forgotten from the Frame: The Absence of the Holocaust Experience of Mizrahim from the Visual Arts and Media in Israel” (published by Resling, in Hebrew), Dr. Kozlovsky Golan relates in an interview with Haaretz, arose when she realized that the Mizrahi (referring to Jews of North African or Middle Eastern origin) students she taught some years ago at Sapir Academic College in Sderot had no knowledge of the history of their communities, or even of their families, during the Holocaust period. The negotiations, led by chief of staff of the Prime Minister’s Bureau Yoav Horowitz, concern the state’s recognition of the injustice done to the families and its responsibility in the affair. The affair concerns the mysterious disappearance of hundreds of babies and toddlers of Mizrahi descent, mainly from Yemen, during the early days after the establishment of the state, between 1948 and 1954. In the vast majority of cases, parents were told in the hospital that their newborn baby had died, though they never received any official confirmation. Over the years, families have claimed that their children were in fact systematically kidnapped and given away or sold off to Ashkenazi families without the consent of the biological families. According to the Kan report, the negotiations are in an advanced stage but a stumbling block is the issue of compensation, a demand of the families which has not been met by the state. For Houstonian Eli Sasson, the deportation is personal. Sasson and his family lived in Tripoli. 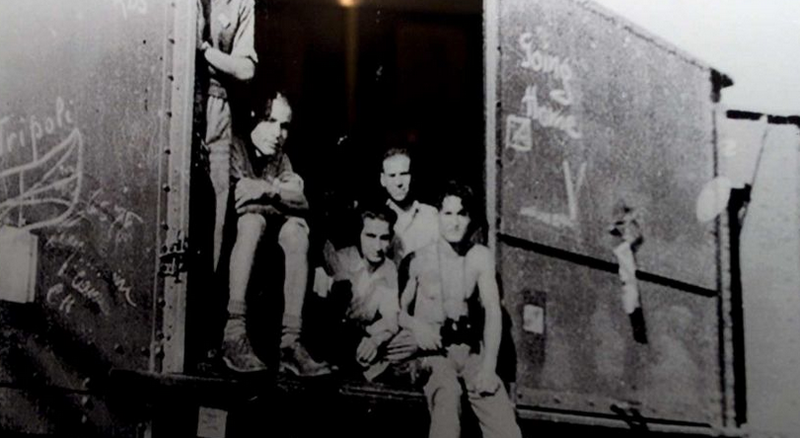 They were among the nearly 40,000 Jews who lived in Libya in 1948. Today, no Jews live in Libya. “From what I learned from my family history, my ancestors came to Libya from Spain,” Sasson told the JHV during an interview in his flood-damaged Willowbend home. “My father owned a building that had a wine factory on the first floor. We lived above the factory. My uncles ran a hardware store and dealt in real estate. My grandfather from my mother’s side owned a granite factory. They cut granite for tabletops and other things. They imported the stone from Italy. It was a prosperous family. Then, following rumors that Jews had killed Arabs praying at the al-Aqsa Mosque in Jerusalem, Arab mobs attacked the Jews in Tripoli. Some 140 Jews were killed. 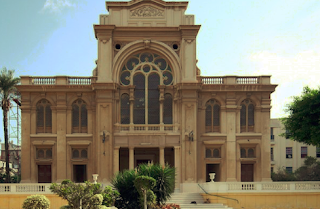 Rioters looted nearly all of Tripoli’s 44 synagogues, along with hundreds of homes and businesses. Years later, Sasson’s mother told him that during the pogroms, her mother and she were hiding under a table in their house, hoping the mob would not break their door down. She related the only reason why the mob didn’t burst through the door was one of the rioters worked for her father. She heard the man through the window tell the mob, ‘Leave them! This is the Sasson house.’ The mob continued on to the next house. “Before the pogroms, life in Libya was good,” said Sasson. “At home, our family spoke a Jewish Arabic. I can speak my parents’ Arabic. but I cannot communicate with Palestinians who speak Arabic. It’s not the same Arabic. My father would write letters in Jewish Arabic. using Hebrew writing. I think the language has disappeared. “After 1945, my father continued living in Tripoli. He believed the worst had passed and nobody knew that Israel would become a state. Even if they had wanted to leave, they had no place to go. 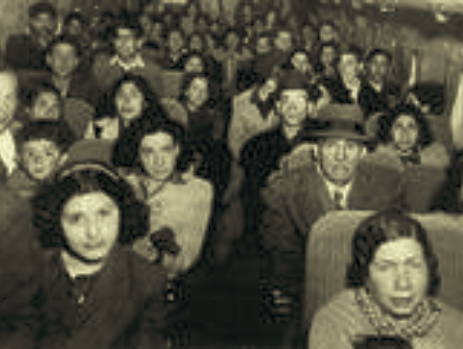 Between 1948-’51, some three-quarters of the 40,000 Libyan Jewish community left the country. Sasson, then age 6, and part of his family got out. The period saw an explosion of Arab nationalism. By Dec. 24, 1951, when King Idris I proclaimed the independence of the United Kingdom of Libya as a sovereign state, Arab nationalism exercised a powerful influence, particularly among the younger generation. The brand of pan-Arab nationalism propounded by Egypt›s Gamal Abdul Nasser after 1952, was based on the goals of bringing down Western-backed governments and the liberation of Palestine. Nasser argued Israel was not founded to provide a homeland for Jews but for the creation and maintenance of a colonial structure in the heart of the Middle East. In Libya, as nationalism increased, so did intolerance of the remaining Jewish community. The government closed Jewish schools. In 1953, Jews became victims of economic boycotts. The Maccabi sports club was forcibly opened to Arab members in 1954. In 1957, a law was passed requiring Libyans, with relatives in Israel, to register at the Libyan boycott office. 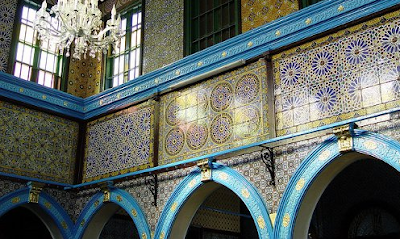 In 1958, Tripoli’s Jewish community ceased to be an independent entity. The community now was to be administered by a state-appointed commissioner. Legal exclusion increased. In 1960, Jews were prohibited from acquiring new possessions, to vote, to hold public office or to serve in the army or the police. And, things worsened after 1967. Libyan Jews were accused of being responsible, along with Israel, for the war that the Arab states lost. “As a result of the Six-Day War, the Arabs felt humiliated by the enormity of the Israeli victory,” said Sasson. “After the pogroms that took 18 lives, the Libyan Jewish community was ordered to leave the country. All you could bring out with you was one suitcase and 25 pounds in currency. The community left everything. “My father owned the building where the factory was located and where we lived. He owned rental properties. 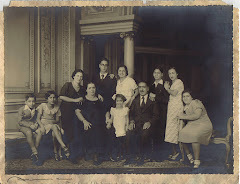 I don’t hear people talking about all the property that my father and other Libyan Jews were forced to give up. Sasson often encounters Palestinians in Houston. When they talk politics, he explains that he is a refugee from Libya. The difference is that he doesn’t let the past totally define his future. Controversy has been rocking Los Angeles, when Jews threatened to boycott a visiting Iranian singer, Mohsen Yeganeh. But the official Iranian news agency Fars has been drooling that concert halls have been packed to capacity for Yeganeh's performances. When news spread light wildfire in Southern California’s Iranian Jewish community late last week that Mohsen Yeganeh, an anti-Semitic Iranian Muslim singer from Iran was going to perform a concert at downtown L.A.’s Microsoft Theater, the community’s activists quickly mobilized using e-mails and social media to calls for a boycott the concert. Hundreds of community members unaware of Yeganeh’s anti-Israel and anti-Semitic song “Flock of Vultures”, cancelled their plans to attend the concert or demanded refunds from the theater. The Farsi language song’s lyrics call Jews vultures, blamed Israeli soldiers for killing Palestinian children and demand violence against Jews. (More information about this controversy can be read here). 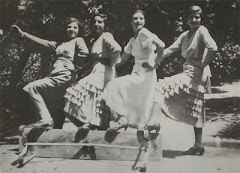 In some ways, modern-day Jewish life in Djerba is made possible by its distance from modernity, and just as the geographical distance from Nazi camps in some ways kept Tunisian Jewry from the worst horrors of World War II, geography also safeguards Tunisian Jewry from the plagues of the 21st century. Djerba is an island, in every sense of the word, and the Jewish community here is cohesive and deeply traditional in a time where many Jews fall into rapid assimilation. The Jewish community in Djerba is young, 50% of them are 20-years-old or younger, and it is a growing community, too; Jewish women in Djerba have an average of 4 children, and some as many as 10. 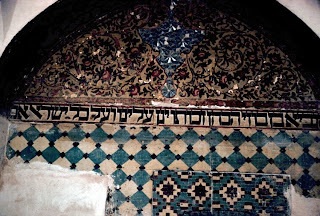 It is both strange and wonderful to feel as welcomed and at home in an Arabic country as I do in Tunisia, and what fills me with an even greater sense of wonder is to see how the Jews here have stayed orthodox and Torah-true, living in relative calm coexistence with their Muslim neighbors. The Iraq-born Israeli writer Eli Amir ignited a touch of drama yesterday when he questioned another Iraqi Jew's wish to return to his country of birth. 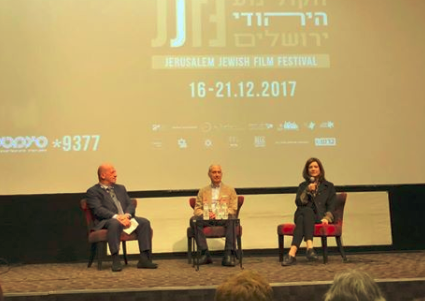 The post-film discussion in Jerusalem featured Edwin Shuker (left), David Dangoor (producer) and Fiona Murphy (director) . The opening sequence of ' Remember Baghdad' features Edwin Shuker getting ready to leave London on his way to buying a home in Erbil, northern Iraq. He wanted to do so in order to preserve the link between his children and the land of his ancestors. After seeing the film, which had its premiere yesterday at the Jerusalem Cinematheque, Eli Amir strode onto the stage , took the microphone and lambasted Edwin's project.
" Why do you want to go back? For what? For whom?" He demanded." For Saddam Hussein? For General Aref? For General Kassem? We have no place in Iraq." The author, who has dedicated his writing career to chronicling the life and times of the Jews of Iraq and the difficulties of their immigration into Israel, said that he had been invited to go back to Iraq following the publication of his book The Dove Flyer to make a film there. He refused the offer. Edwin Shuker defended his dream: it might someday become reality. "Who would have believed,' he said, "so soon after the Holocaust, that Berlin might again become a thriving centre of Jewish life?" In any case it was impossible for Edwin to reach his new house at present, as all transport links to Kurdistan had been cut since the ill-fated September referendum on independence. Iraq: do Jews really want to return? The news of the Islamic State’s defeat in Iraq this month brought a smile to Londoner Edwin Shuker’s face. For Shuker, 62, this was another step to realizing his dream – to return to the country he fled 45 years ago. He took the first step to that end two years ago when he bought a new house in northern Iraq and became, as far as is known, the first Jew in decades to buy a home in that suffering land. 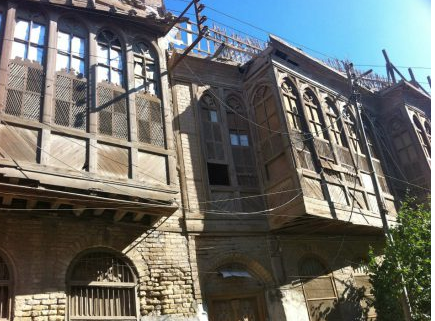 Shuker told Haaretz he knows several other Jews of Iraqi descent who visited the old country in recent years, “but I don’t think there’s another madman who actually bought a house there like me.” The deal wasn’t an investment. “It was mainly a symbolic act that turns me from just a tourist into a man who wants to settle in Iraq,” he said. Shuker’s move is indeed unusual, but it reflects a trend in recent years among Jews who left Iraq, mainly for Israel and Britain. The first overtures were made in 2003, after Saddam Hussein’s ouster. They were resumed this year amid the decreasing frequency of bomb attacks in Baghdad. In December 2016, Iraq Day – a cultural exhibition organized by Iraqi students – was held at Imperial College London. Prominent members of London’s Jewish community were surprised to receive an invitation to exhibit their books about the history of Iraq’s Jews. “Our stall was the most popular one there and all the books were sold,” says Londoner David Dangoor, who was born in Iraq in 1948 and left when he was 10. As he puts it, the Iraqi ambassador didn’t cringe when he saw that the books had been printed in Israel. Tsionit Fattal Kuperwasser, whose parents immigrated to Israel from Iraq, didn’t imagine that her first novel, “The Pictures on the Wall,” about the Jewish community in Iraq during the last century, would become a best-seller in her parents’ homeland. The book, which was published in Hebrew in 2015, was translated into Arabic this year and became the first Israeli book to be published in Iraq. “When I wrote the book I wanted to connect to my Iraqi-Jewish roots; I didn’t think it would be read by Muslims in Iraq as well,” Fattal Kuperwasser says. But in the era of social networks, Iraqi intellectuals, authors and journalists heard of her novel even before the translation and started discussing it on Facebook, in newspapers and at universities. The ties between Iraqi researchers and Iraqi Jews in Israel was established by Prof. Shmuel Moreh, a native of Baghdad and an Israel Prize laureate for Middle Eastern studies, who died this year. The warm eulogies published in Iraq after his death attested to the yearning to resume ties. Two years ago he went to Iraq, returned to the house where he grew up and visited one of Baghdad’s synagogues, which was renovated and restored – but empty. Unlike others in whom the Farhud trauma was seared for life, Shuker prefers to remember an Iraq where Jews and Arabs lived in peace. He looks for contemporary partners with whom to renew ties. This month the documentary “Remember Baghdad” – the story of Iraq through the eyes of the Jews who lived there for 2,600 years – premiered in London on the 100th anniversary of the British invasion against the Ottomans in 1917. The movie sheds light on the Jews’ good life in Iraq before they were driven out or fled. It shows picnics on the banks of the Tigris, royal balls and a material and cultural wealth that marked the community in its heyday. Like Shuker, Dangoor misses Iraq. He remembers the villa on the Tigris where he grew up. His father held the Coca-Cola franchise in Iraq, and his mother was elected Miss Baghdad in 1947. To this day her picture appears on Iraqi websites as a symbol of nostalgia. “Iraq is still in our blood and bones,” Dangoor says. A delegation from the Iraqi Embassy in London attended the documentary’s premiere. “After the screening they said they were looking forward to the day when Iraqi Jews would be able to visit Iraq,” Dangoor says. The film will be screened in the Jerusalem Cinemateque on Sunday and Monday. Dangoor has already taken the first step to normalize his relations with Iraq. In London, he has voted in Iraqi parliamentary elections. He says other Iraqi Jews have applied for passports too, but so far in vain. Israeli author Eli Amir’s novel “The Dove Flyer” will soon be published in his native Iraq, where his books have been popular for years. His attitude is different. BERLIN, Germany (JTA) — Anti-Semitism among Muslim refugees is rampant and requires urgent attention, a new study suggests. But the study, commissioned by the American Jewish Committee’s Ramer Institute for German-Jewish Relations in Berlin, also finds that refugees from persecuted minority communities are more likely to take a stand against anti-Semitism and for Israel. Titled “Attitudes of refugees from Syria and Iraq towards integration, identity, Jews and the Shoah,” the research report was prepared by historian and sociologist Günther Jikeli of Indiana University and the University of Potsdam, Germany, with help from Lars Breuer and Matthias Becker. The report, based on interviews with 68 refugees, comes amid a series of virulent anti-Israel and anti-America demonstrations in the German capital denouncing the US recognition of Jerusalem as Israel’s capital. Thousands of protesters burned homemade Israeli flags and crowded city subway stations chanting anti-Israel and anti-American slogans on their way to rallies. The numbers of refugees among the demonstrators was unknown. At the same time, in a show of solidarity with Jewish communities in Germany, local imams joined with Christian and Jewish leaders in public celebrations of Hanukkah, including the annual candle-lighting ceremony at the Brandenburg Gate, where Rabbi Yehuda Teichtal of Berlin was joined in a cherry picker by Mayor Michael Mueller. Security has been tightened throughout Germany and at Jewish venues. Palestinians have refused a Bahraini delegation from entering Gaza after the group visited Israel amid ongoing controversy over the US decision to move its embassy to Jerusalem and recognise the city as Israel's capital. The interfaith "This is Bahrain" civil society group defended its visit to Israel on Monday, a day after its trip was reported, as a gesture of tolerance. The 25-member group, which is on a five-day tour, includes Sunni and Shia Muslim leaders, Christians, the leader of a Hindu temple, and a Sikh. It aims to visit Islamic, Christian, Jewish and other holy sites, the group said, according to a statement carried on Bahrain's state news. After widespread outrage, a coalition of various political factions condemned the group's attempt to visit the besieged Gaza Strip, home to two million Palestinians. The Palestinian National and Islamic Forces in Gaza said there was no place for those who normalise relations with Israel in Gaza - or any other place of the occupied Palestinian territories. It added that the people of Gaza would prevent the delegation from entering the enclave. Fifty years ago, murderous riots broke out in Aden. History was repeating itself - over 80 Jews were killed in 1947. Robert Philpot describes the rescue of the remaining community, and how a British soldier helped save Sefrei Torah in The Times of Israel. Three Jews trapped in the Crater district of the port city were attacked by an armed mob; two were brutally murdered, the third was found alive but barely able to breathe. For those old enough to remember, history appeared to be repeating itself. Twenty years previously, in the wake of the UN vote to partition Palestine, Jewish businesses, stores, and homes had been attacked in Aden. Two Jewish schools were burned down. At the end of three days of violence in December 1947, more than 80 Jews were dead. “There were not riots but murder,” Joseph Howard, a child at the time, later remembered. A British commission of inquiry into the disturbances later found that “trigger happy” firing by soldiers of the Aden Protectorate Levies — an Arab military force trained and armed by the UK to protect its colony — were responsible for many of the Jewish deaths. These local forces, the inquiry concluded, were sympathetic to the rioters, and did not attempt to control them. The inquiry recommended British troops be permanently stationed in the colony. For Britain, which was urging Arab countries to protect their local Jewish populations at the very moment it had so conspicuously failed to do so, these events were a source of considerable embarrassment. In the summer of 1967, Britain had an opportunity to redeem itself. The sun was finally setting on the British Empire; Harold Wilson’s government was readying to pull its forces out of Aden — one of the UK’s last remaining colonies — thus bringing to an end 128 years of British rule. The last four years of that rule — the so-called “Aden Emergency” — had been particularly bloody, as Britain and the army of its newly created Federation of South Arabia battled an insurgency led by the National Liberation Front (NLF) and the Front for the Liberation of Occupied South Yemen (FLOSY). By 1967, the Jewish population of Aden had dwindled to a mere several hundred compared to 4,500 in 1945. As tensions across the Middle East rose in the weeks before the Six Day War, there were attacks on Jewish homes and shops. 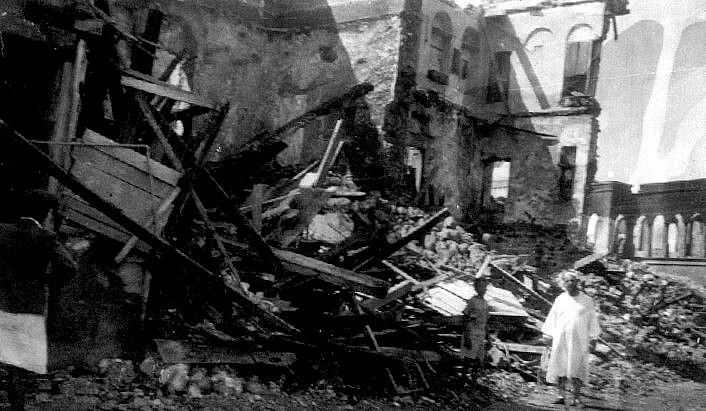 With the outbreak of the conflict, Jews crowded into Tawahi — a suburb of the main city which was home to the British governor and one of the safest places in Aden — where they sheltered under the protection of British troops. One of those soldiers was 24-year-old Dougie Skilbeck. Fifty years on, he reveals a remarkable tale of kindness and bravery which perhaps helped to bring the final chapter of Britain’s relationship with the Adenite Jews to an honorable close. Despite his youth, Sergeant Skilbeck was hardly a rookie. Based at Radfan Camp in the desert, Skilbeck’s platoon was charged with guarding the Jewish population and helping to prepare their evacuation, which was being arranged in London by Barnett Janner, a Jewish Labour MP and former president of the Board of Deputies of British Jews. Skilbeck remembers many of the Jews living in the back of shops in Tawahi or at the Jewish-owned Victoria Hotel, as they waited to be airlifted out. The atmosphere was “extremely tense and awful for the Jewish population,” he says. “They had been targeted by the Arabs and some of them had been humiliated and even murdered.” But as they prepared to leave, some of the Jews had unfinished business to attend to. They turned to Skilbeck for help. The day before the evacuation, he was approached by a rabbi. “He pleaded with me to help him save the holy scrolls,” Skilbeck recalls. The mission was fraught with danger; the scrolls were in Crater, by now controlled by NLF and FLOSY guerillas and thus not only a no-go zone for Jews but also for British troops. Skilbeck and another British soldier agreed to help. His reasons were simple: his first army tour of duty was in Germany and he was stationed at the same barracks where his father had been at the end of World War II. “I knew a lot about what happened to the Jews in Germany and I felt a lot of sympathy … [seeing] the Jews persecuted once more. Foolish or not, I was a young man but I wanted to help if I could,” says Skilbeck. At nightfall, the two British soldiers, the rabbi and two Jews who were accompanying him set off for Crater. By now off duty, Skilbeck drove the unmarked military minibus which he had borrowed for the “totally unofficial” assignment. Unaware of the route, he was directed by the rabbi. < Luckily, the minibus was not stopped at either of the military checkpoints which it passed through on the “extremely tense” 30-minute journey. “We could have been ordered to turn round or taken back … Seeing the machine gun laying on our laps, they could easily have opened fire on us not knowing who we were,” says Skilbeck. Skilbeck is puzzled to this day about who it belonged to, but suspects it may have been a member of an SAS unit — Britain’s elite special forces — who were still operating in Crater at the time. About 20 minutes later, Skilbeck heard a machine gun firing blindly and bullets whizzed past him down the street. The group had saved three scrolls and wanted to save more, but scrambled into the minibus and raced back to Tawahi. Looking back as they made their escape, the men saw that the synagogue had started to burn. “We were extremely lucky and God must have been on our side,” Skilbeck believes. Alexandrian lawyer Sherif Jadallah says this has nothing to do with the US recognizing Jerusalem as Israel's capital. Instead, he claims it is a response to Israel banning Muslims from the Al aqsa Mosque for a few days earlier this year after three terrorists used it as a base to murder Jews. 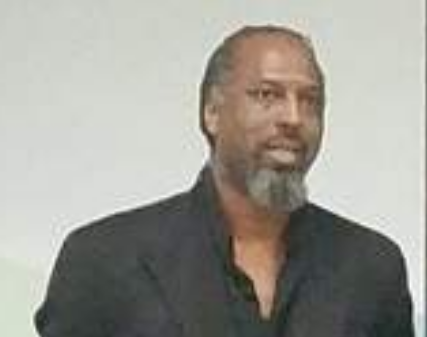 "The Jewish religious intransigence and persecution of Muslims must be met with a clear popular legal response to the prohibition of Jewish religious rituals and to allow us to perform Islamic religious rites within their Jewish temples," Jadallah said, in accordance with what he laughably called a principle in international law called "reciprocity." The lawyer is targeting December 29th to ban Jewish worship in the synagogue and allow Muslims to take it over. Now that there are nearly no Jews in Egypt, the country has been spending money to restore their old synagogues - for tourists, but not for prayer. Seventy-five years since the Nazi occupation of Tunisia, this video is a precious visual record of the six months of hell suffered by the Jewish community. The first round-up of Jewish males took place on 9 December 1942: some 5,000 Jews were to be sent to forced labour camps. The procession took one Jew past his own house. His neighbours, whom he had always got on with, stood on their balconies shouting: 'Dirty Jews!' It was then that he became a Zionist. Admiral Esteva, a practising Christian, who headed the French administration, had failed to put into place some of the statut des juifs discriminatory laws: the ruler Moncef Bey said he considered Tunisians of all faiths to be his subjects. Had the Allies not liberated Tunisia, it is thought that the Nazis would have put into effect their plans for exterminating the Jews. 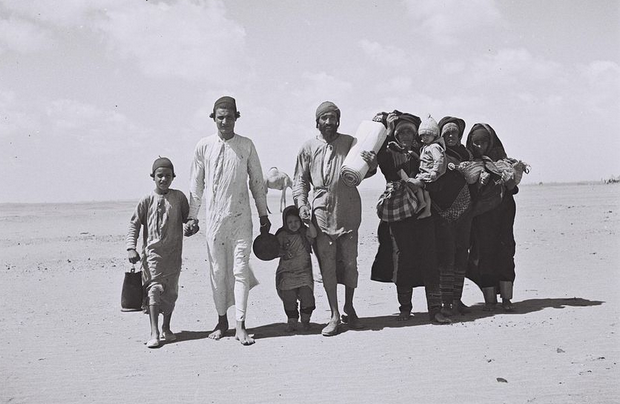 Powerful piece in the Huffington Post to coincide with the Memorial Day for Jewish Refugees from Arab lands, by Israeli of Yemenite parentage Shahar Azani and Emily Schrader. From Yemen they fled, as they did from Iraq, Libya, Egypt and elsewhere in the Middle East. 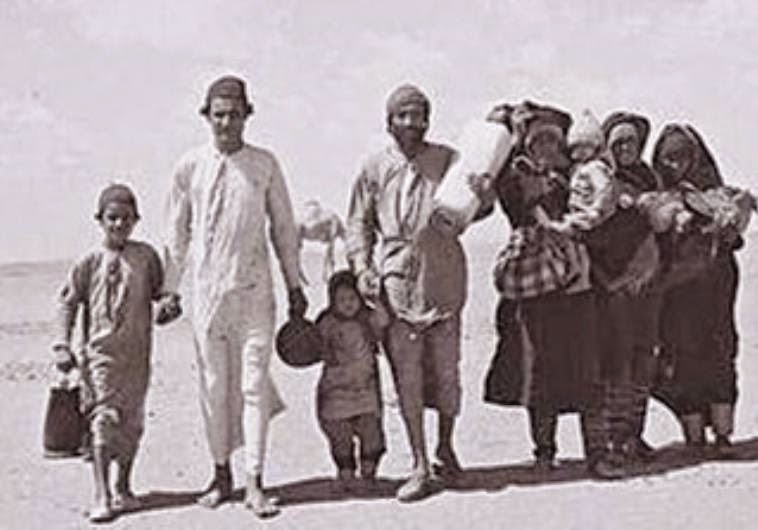 This year on November 30, Israel will remember the 875,000 Jewish refugees from Arab countries, who left everything behind, as they ran for their lives and returned home to the newly re-established State of Israel. While recognition within Israel is needed and welcome, this is not the case with the international community, so far failing to seriously acknowledge this issue, not to mention discuss reparations for the forgotten refugees. Every year Kristallnacht is solemnly remembered – one night of virulent antisemitism which marked a turning point in the Nazi barbaric campaign of genocide against the Jewish people. Yet, even though so many ‘Nights of Broken Glass’ occurred all over the Arab world, those seemed to have escaped world attention. The history of persecution of Jews in Arab countries is an undeniable fact, yet we see no hint of an international community willing to address it, or even recognize its mere existence! Acknowledging the pain of so many who left so much behind as a key for future settlement seems to be a well established principle of conflict resolution, yet as far as Jewish suffering is concerned, this suddenly seems inapplicable. Perhaps most importantly: why is it that despite centuries of expulsions, pogroms, land confiscation, apartheid laws and more, not a single Arab country has been held accountable for their heinous crimes against the Jewish people?! Scholars dispute the exact amount, but value of property stolen from Jews is estimated to be between $6 and $100 billion dollars, with that in Iraq alone estimated at $30 billion in today’s values. In Egypt, Jews suffered immense persecution despite the fact they had a presence there which predates Islam. In the 1930’s and 1940’s Jews faced murderous riots that left hundreds dead. 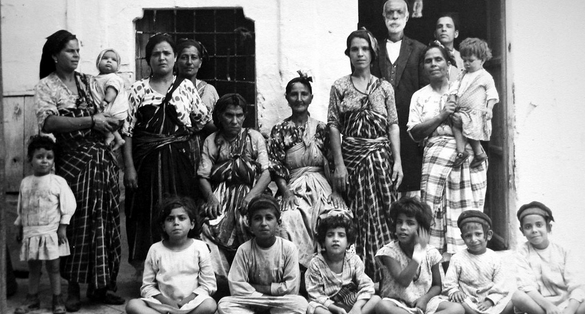 In 1948, the Egyptian government arrested thousands of Jews and confiscated their property without compensation. 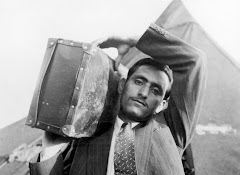 In the 1950’s, Egypt expelled 25,000 Jews confiscating all their property and permitting them only one suitcase leaving the country. Today there are less than a dozen Jews left in all of Egypt, yet the government has never apologized or been held accountable for their crimes. The Egyptians were not unique in their persecution of Jews. In Iraq, Jews suffered numerous pogroms at the hands of pan-Arab nationalists, a Nazi supporting regime in the 1940’s, and radical Islamists. In the 1940’s, Iraq passed a series of apartheid laws against Jews confiscating their property, stripping them of citizenship, and forcing their businesses into bankruptcy. They were forbidden from attending the same schools as non-Jews, holding public office, and a myriad of other discriminatory laws. Jews were publicly hanged in the streets and accused of being Zionist “spies.” Over 100,000 Jews fled the country from 1948-1951. Today, Iraq has been completely ethnically cleansed of its ancient Jewish community. In Syria, in the 1940’s and 50’s, the Syrian government emptied all Jewish bank accounts and confiscated all Jewish property. Jews were fired from all government positions, forbidden from traveling more than 3 miles from home, banned from having driver’s licenses, and from leaving the country. In Yemen, Jews were given a choice of converting to Islam or death. In the 18th century, the “Orphans Decree” was issued stating that Jewish orphans were to be taken and converted to Islam. This decree was reinstated in 1922. 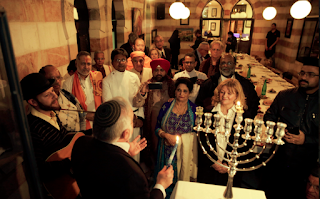 Today less than a handful of Jews remain in Yemen. There are similar stories of oppression, especially in the 20th century, of Jewish communities in Morocco, Tunisia, Libya, Lebanon, Algeria, and even Iran. Remarkably, many of these refugees came home to Israel and miraculously built flourishing lives for themselves and all those around them. But the story of their oppression must be told if we are to pursue any chance of peace in the future. Israel is not a perfect country, but for all the criticism of the Jewish state, it is one of the only countries where non-citizens (Palestinians for instance) can take a lawsuit straight to the highest court in the land, and win their case. Can the same be said of Iraqi Jews whose property was stolen? 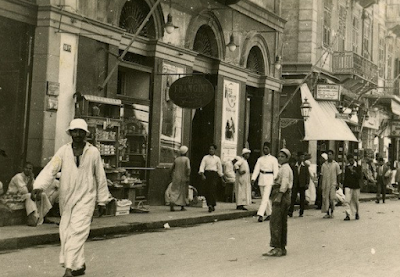 Of Egyptian Jews whose businesses were confiscated? Of millions of Jews from the Middle East who lost precious family members because of heinous anti-Semitism and Islamic extremism?! The issue before us is clear: How can there be true peace, without justice? At a ceremony on 16 November 2017 in Rabat, a high-level French delegation handed over to the National Archives of Morocco copies of thousands of Judeo-Moroccan documents, enriching its collections and giving new impetus to academic research on Moroccan Judaism. 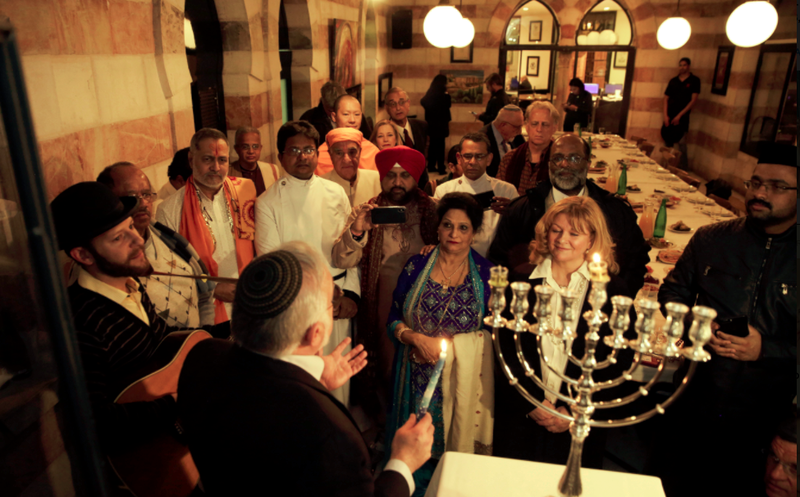 The handover is significant because it will enable Moroccans themselves to study the history of their Jewish community. 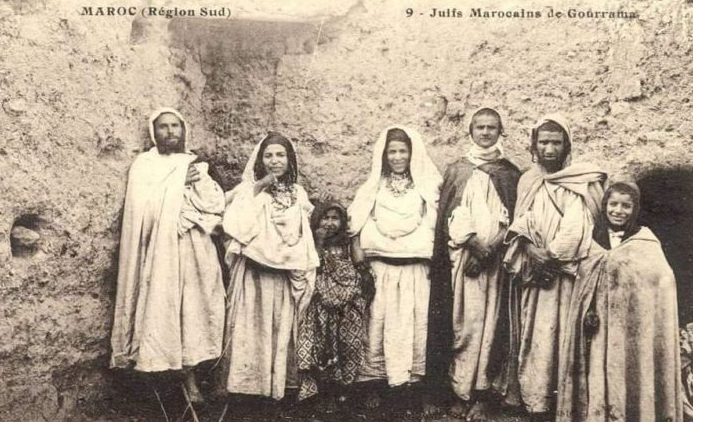 One of the postcards handed over to the Moroccan Archives shows the Jews of Gourrama, in the south. The director of the Archives of Morocco, Jamaa Baida, acclaimed the handover of these 'extremely rich' historic documents from the diplomatic archives of France and the Holocaust Memorial in Paris. Much of this archive has been digitized by Washington's United States Holocaust Memorial Museum and negotiations are still in progress to fund further work. The Shoah Memorial gave the National Archives of Morocco 373 photographs from different collections and from multiple sources: postcards evoking Jewish life in Morocco at the end of the nineteenth century, private photos of Moroccan Jewish families and items from the press and photographic collections of Moroccan Jewish organizations such as the youth movement of the Israel Scouts of France or the OSE. The Memorial also provided a copy of its documentary archive on the situation of Jews in Morocco during the Second World War. This consists of 1048 documents from different collections: geography of Morocco, the Commissioner-General on Jewish Questions, and the Maurice Vanikoff archive. For her part, the French Minister of Culture, Françoise Nyssen regretted the fact that "Judeo-Moroccan memory is today incomplete, mutilated and amputated" and that archives are "scattered around the world and difficult to access". She considered that handing over archives to the Kingdom will help Moroccans know more about Moroccan Jewish History in the last 150 years and make it possible for Moroccans themselves to write the history of Moroccan Judaism. 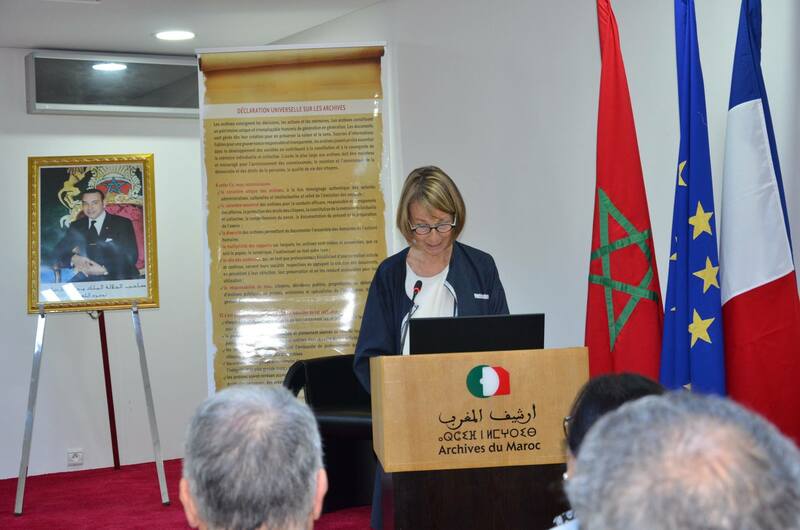 The French Minister for European Affairs, Nathalie Loiseau, said that the archives submitted to Morocco consist of important collections in the history of the Moroccan Jewish community as well as wartime and colonial files from 1936 - 55. Listeners did not however hear what those “troubles” actually were. After Stourton had asked questions about Mr Dangoor’s great-grandfather and his mother – the first ‘Miss Baghdad’ – he went on to inaccurately claim that the idyllic life portrayed so far had ended because of the establishment of the State of Israel. On the Tube home the other night, after a screening of the wonderful new documentary Remember Baghdad, I fell into conversation with one of the audience, an Iraqi (non-Jewish) lady called Dina. We were complete strangers but found ourselves talking about the film and its effect on us. She told me that she had lost her family home and had been displaced as a result, but has recently returned to Basra a few times for work. The day after I received an email from her accompanying the photos of old Jewish houses in Basra that she had promised to send me. My first trip back to Iraq since I left in 1976 was in 2009 to Basrah, where my work took me. I was anxious for days before, for whilst I was homesick I knew that I longed for an Iraq and a Baghdad that are no longer there. What was I going to see ? How will people greet me, knowing I’ve been in London while they’ve endured war after war ? I landed in Basrah and the minute I smelt the air, I know I had come home. I felt an overwhelming sense of belonging. Everything, from the pebbles to the weeds at the side of the road looked familiar and were welcoming me back ! Work aside, I asked the driver to take me to the old parts of Basrah. He was surprised and bemused, could not understand why I’d want to see old buildings. He finally consented, and told me he will take me to Biyoot il Yahood (The Jews’ Houses). He then started telling me how his parents and grandparents told him stories of how they all lived together in harmony, Muslims, Jews and Christians, and how they were great friends and neighbours. It was so sad to see the state they’re at. I’m not sure if they’re protected or not, but they are certainly not maintained or refurbished. Many have squatters in them, I’m told they’ve ruined the inside. One or two are taken over by artists and poets’ socieities who admire and understand the value, who lobby the council often to do something about the state of the houses (falls on deaf ears), and who are penniless so can’t really do much about them. They hope that by occupying them as artists they can at least prevent squatters or worse. These photos were taken in 2011. I will go back to take more detailed photographs, and if anyone recognises a building in particular, I’d be very happy to go back and take more photos. Walking by these faded crumbling edifices filled me with great sadness. These were homes that were filled with laughter, with the exquisite smells of cooking, with the fragrant garden plants in the evenings. These were homes filled with hope, with families, with joyful and sad occasions. How can they now stand so empty, so barren ? How the wind whistles through the gaps, how the memories float through the air, how the souls of those no longer there must roam around, wringing their hands in despair and sadness. But I am happy that they are there. I am happy they are referred to as Biyoot il Yahood. I am happy that they stand, proud and resilient, lest we forget. The story of the dispossession of Joseph Smouha, who built Smouha City in Alexandria out of marshland, is a remarkable one. What is perhaps more remarkable, is that this article by Joseph Braude appeared in the Arab magazine Majalla (with thanks: Richard). Ask a young Egyptian what “Smouha” means and he will likely tell you it is an excellent football team in Alexandria, lately ranking third in Egypt’s premier league. He may also know that the team takes its name from Smouha City, a resplendent Alexandrian suburb. 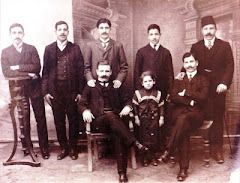 It may further surprise many Egyptians to know that the builder of Smouha City, Richard’s grandfather Joseph, was an Iraqi Jew, born in Baghdad in 1878. At age 14, he moved with his family to the British city of Manchester, where he gained his education and began a prosperous career as a cotton broker. At age 36, with the outbreak of World War I, he closed his business and offered himself for public service. What would lure him away from his government work and back into the private sector was a dream — a vision — which came to him neither in his native Iraq nor in his adopted country of Great Britain but in Egypt. In 1923, while visiting the country on behalf of the British government, he was riding the train from Cairo to Alexandria, along the edge of then-mosquito-infested marshlands adjoining the lakes of the Nile Delta. He observed that the swamps were effectively blocking the expansion of Alexandria — an untenable situation in light of the city’s burgeoning economy and natural demographic growth. He explored the matter with Alexandrian friends and officials, who welcomed his interest in the problem of the marshlands. They offered him ownership of 700 acres of hazardous territory for free if he would commit to draining the swamps at his own expense. Smouha insisted on paying a commercial price for the area. He proceeded to move his wife and eight children to the ancient city and embark on the project of his lifetime. At the time, seven percent of the inhabitants of Alexandria — approximately 24,000 people — were Jews. (The Jewish population in all of Egypt totaled 80,000.) The Alexandrian Jewish community was prominent in nearly every field of human activity: Jews ranked among the more sought-after doctors and lawyers, contributed prolifically to the public discussion, and served as teachers to tens of thousands of Egyptian students. Among prominent bankers and financiers, for example, the Menashe family — which also came from Iraq, in 1795 — invested in the human development of Alexandria by establishing schools for poor children. But Joseph Smouha never imagined his construction project as an enclave for any particular ethnicity or sect. To the contrary, he envisioned an organic extension of cosmopolitan Alexandria that would embody the city’s finest traditions of diversity and coexistence. Smouha invited architects in Egypt and across the European continent to compete for the privilege of helping to design the new area. The plan called for all the features of a town: residential housing, schools, hospitals, an industrial zone, a police station, a post office — as well as a church, a synagogue, and a mosque. It was in essence an Alexandrian appropriation of the concept of a “garden city,” which had begun to appear in Great Britain, whereby an entire urban ecosystem was constructed simultaneously on a discrete piece of land. Smouha proposed to name the project Fouad City, after the country’s then-reigning king. But the monarch insisted it be known as Smouha City instead. It became an upscale residential suburb. The many indigenous elites who took up residence there were joined by former European royalty, including the exiled King of Italy, Victor Emanuel, who lived and died there. Over time, Smouha City also came to include a race course, golf course, and sports club. Within a few years, a new town had appeared out of nowhere and taken root as a seamless extension of the city to which it was affixed. 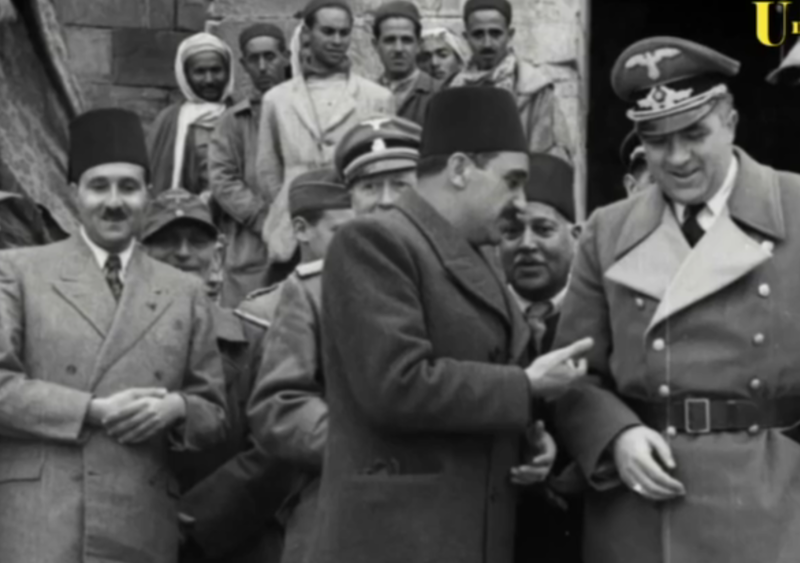 The man who founded it, however, suffered an altogether different fate: On November 23, 1956, following the Suez War, President Gamal Abdel Nasser issued a proclamation declaring all Jews to be enemies of the state. Jews had already been leaving in significant numbers prior to the declaration: Amid a wave of anti-Jewish fervor following the establishment of the State of Israel and the first Arab-Israeli war, bombings of Jewish areas killed 70 Jews and wounded nearly 200, while riots claimed many more lives. 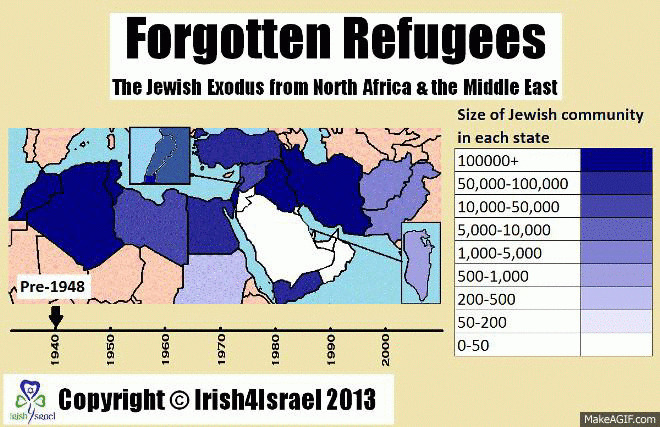 The 1956 proclamation caused 25,000 more Jews to flee for Israel, Europe, the United States, and South America. Their assets were confiscated by the government. Smouha City, too, was sequestrated, nationalized, and confiscated, in a wave of such actions taken against British and French property as well. Joseph Smouha saw his beloved Alexandria for the last time in 1957 — which was also the year Abdel Nasser evicted Armenians, Greeks, and a subset of Egyptian Coptic elites from Alexandria. Shortly before his death, the Smouha family filed a claim for compensation for the value of the expropriated property with the British Foreign Claims Commission. The government body had been established to make payments to British nationals from the 27.5 million pounds sterling ($77 million) which Egypt paid Great Britain in settlement of all claims for property in Egypt. The Smouhas believed that the value of the properties — excluding the schools, hospitals, houses of worship, and other facilities which Joseph had donated— was 12.5 million pounds sterling ($35 million), or the equivalent of 260 million pounds ($371 million) today. But the family received only a small fraction of that sum, because the settlement was calculated on the basis of the territory’s value as farmland rather than developed urban property. 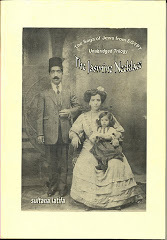 In some ways, the story of Joseph Smouha is a microcosm of the story of close to one million Jews indigenous to the Middle East and North Africa who almost completely vanished from the landscape, largely over 25 years, from 1948 to 1973 — the historical blink of an eye. In Iraq, Yemen, Syria, and elsewhere, their history dated back millennia, almost to the dawn of monotheistic history. 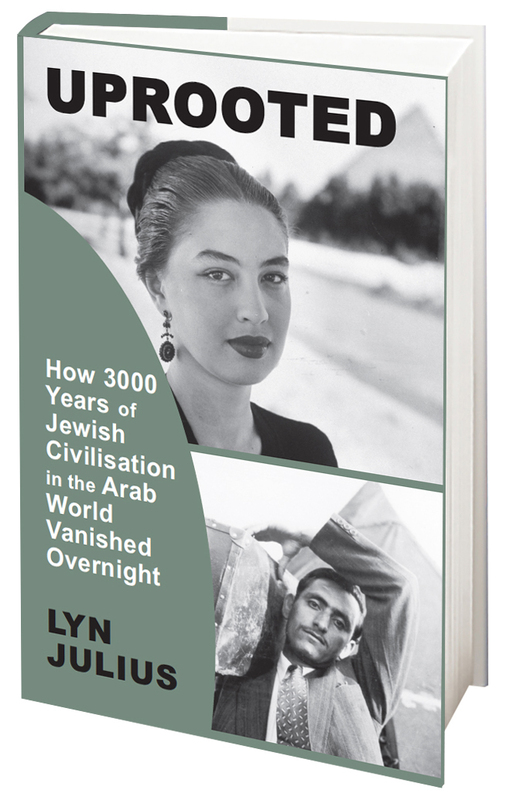 In other parts of the region, their history dated back centuries — in North Africa, for example, to the period of the expulsion of Jews as well as Muslims from what had once been called Al-Andalus; or as a result of comparatively recent historical migrations. Their expulsion over the mid-twentieth century stemmed from a complex combination of historical factors. The most obvious, however, was the policy of numerous Arab military republics — supported by substantial elements within the society — to collectively punish all Jews for the establishment of the State of Israel, regardless of whether they happened to support the new country or not. The Arab world effectively disgorged a piece of its soul: one of its oldest communities, a professional class, a force for civil society and progress. Much of what the Arab world lost, Israel gained: hundreds of thousands of talented and resourceful people who, together with their offspring, now make up the majority of the country’s Jewish population. This pivotal million, in crossing over from one world to another, underwent the trauma of refugees everywhere: they left behind the only way of life they had known in hopes that something better lay ahead. Some lost their lives en route. Nearly all were dispossessed of their property and assets, arriving penniless at their destination. According to a 2007 study by the World Organization of Jews from Arab Countries, total real estate lost to the region’s Jewish property owners exceeded 62,000 square miles — a land mass nearly eight times the size of the State of Israel. Financial losses have been conservatively estimated at the present-day equivalent of $80 billion. A hard-working and resilient community, they sought to integrate into their adopted countries and establish a decent standard of living again from scratch. Part of what makes their exodus bitter is not the losses they incurred by fleeing, but rather the loss Arab societies brought upon themselves by discarding them. In the present period of metastasizing human suffering in the Middle East, amid new waves of ethnic and sectarian cleansing and the massive displacement of peoples and their loved ones, this sad chapter in the region’s history bears remembering. Doing so is an important part of the introspection our societies need in order to begin the process of reconciliation and redress for peoples of every indigenous religion and faith. 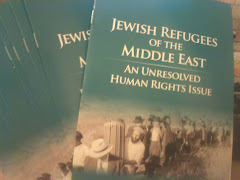 Moreover, the remnants of the Arab world’s indigenous Jewish communities, scattered as they are across the globe, are themselves a potential asset as Arab countries begin to turn their eyes toward reconstruction: Despite the bitterness of the latter years of Jewish communal life in the Arab world, many of the refugees and their descendants cherish the happier memories long past, and long for the friends they lost when they were forced to flee. These positive human sentiments, if effectively tapped by extending a hand of friendship, could potentially provide a foundation on which to build — enabling new partnerships to accelerate the pace of renewal across the region.